A recovery in memory chip prices drove the company's revenue and earnings higher. Shares of memory chip manufacturer Micron Technology (NASDAQ:MU) soared on Thursday following the company's fiscal first-quarter report. Strong pricing for DRAM and NAND chips led the company to beat analyst estimate on all fronts and provide exceptional guidance for the second quarter. The stock was up about 13.5% at 11:15 a.m. EST. Micron reported revenue of $3.97 billion, up 18.5% year over year and about $20 million higher than the average analyst estimate. Compared to the fourth quarter, DRAM and NAND bit volume was up 18% and 26%, respectively. Average sales price jumped 5% for DRAM and was flat for NAND, while Micron's per-bit costs declined for both types of chips. Non-GAAP earnings per share came in at $0.32 per share, up from $0.29 during the prior-year period and $0.04 higher than analysts were expecting. Both numbers back out some costs as per the accounting changes that Micron announced in October. Earnings dropped on a GAAP basis, with EPS of $0.16 down from $0.19 during the first quarter of last year. Higher interest payments and a higher tax rate were the main reasons for the decline. Positive market momentum, driven by favorable demand trends and limited industry supply, produced solid results for our first quarter. We continue to make significant progress on our key technology and product initiatives, and we are pleased to have closed the Inotera acquisition on December 6, 2016, which we expect to further improve Micron's strategic position and financial results. Micron's business is cyclical. The company has been battling depressed memory chip prices for multiple quarters, so the recent strengthening of DRAM and NAND pricing has been a welcome change. Micron expects this momentum to continue into the second quarter, predicting revenue between $4.35 billion and $4.70 billion and non-GAAP EPS between $0.58 and $0.68. Investors have been pushing up Micron stock all year in anticipation of a return to growth. Historically, periods of rising memory prices and lush profits for Micron have never lasted very long, and this time is unlikely to be different. 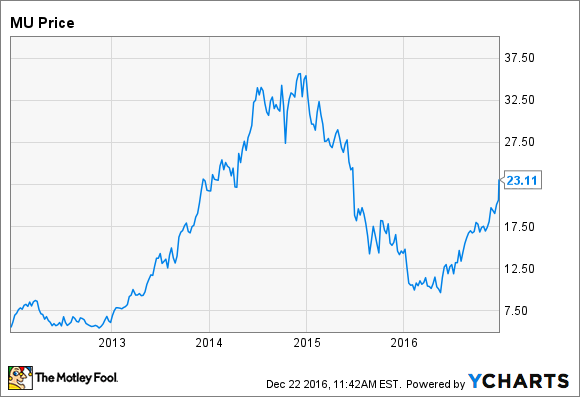 The next few quarters should be solid for Micron, but beyond that is anyone's guess.